On the Friday before Small Business Saturday I was interviewed by Al Jazeera Arabic Television for a piece they wanted to air on The Future of the Book, including the transition from print books to eBooks coupled with why the independent bookstores, or indies, are thriving when the big box stores have closed their doors. The producer explained that where this will be aired, primarily the Middle East, there are not very many bookstores and this would be an opportunity to perhaps revitalize the book industry in these countries. This interview gave me a chance to think about the future of the physical book and answer why Bank Square Books is flourishing and why it makes sense to open a second store in Westerly, Rhode Island next spring. After Small Business Saturday, a day of shopping locally sponsored by American Express, the media outlets reported that retail sales were off by 11%. That was not the case for us whatsoever. For each of the past three years our sales on Small Business Saturday have increased by 10-20%. Across other indie bookstores sales were up on the average of 4.6%, and AMEX reported that sales across all indie businesses were up 2.1%. People have seen the value and importance of shopping along their local main street and what that means to their community as a whole. If you spend the money in your town it stays there. In the interview, I explained that I believe there will always be print books. The largest percentage of readers read both eBooks and print books. Only a very small percentage read solely on a digital device, and a slightly larger percentage read only a book they can hold in their hands. When the digital devices were launched, they were new and shiny and fun to play with. The glow has dulled a bit from “Wow, I really like reading on my iPad” to, “no I tried it and don’t like it,” or “my daughter gave me one and I returned it and used the money to buy real books.” I understand everyone has a choice as to how they prefer to read but there are many readers who walk into a bookstore and remark how they love the smell of books and they just need to hold one in their hands. When asked why the indies are not only surviving but thriving when the big box store have closed or are struggling, I replied that we have maintained our focus on selling books, not digital devices or clothing, and making customer service and the human interaction our top priority. We are a staff of people who are passionate about what we do, and love to spend time with our customers to make sure they find just the right book. Yes, we sell gift items and have experimented with the Kobo eReaders, but we are a bookstore selling physical books first and foremost. A bookstore is a gathering place hosting shelves of discovery, a place where you can come with a cup of coffee and your dog and meet authors, talk about books or hold a community meeting. Online shopping does not offer this same human experience. What can we do to ensure that the indie bookstores continue their growth and success? 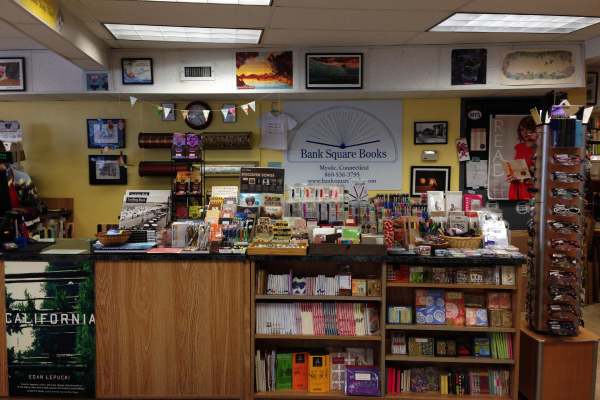 Bank Square Books has been through a lot in the past few years with the Mystic Streetscape, flooding during Tropical Storm Sandy but we expanded a year ago and sales have been up each month ever since. We now have 4500 sq. ft of retail space, a dedicated event space upstairs that can hold 75 people, a real office with a door, and three checkout stations. In late spring 2015 we will become the operators of Savoy, Bookstore and Café, in the former Savoy Hotel in Westerly, Rhode Island. Our future landlord remarked that he “cannot imagine a town without a bookstore or a library.” The excitement from customers about all this growth and success is palpable. If this isn’t excellent customer service, I am not sure what is. Our staff love working at the store, wrapping holiday gifts for free, and making recommendations for everyone’s families. Without the loyal support of our customers and communities, the indie bookstores would not be in the shape they are in currently, growing and thriving. It takes an education and hard work to ingrain in people that the physical book is still important and vital to our literary intelligence but it’s worth it.